Well if you thought yesterday’s post was long, this one may end up being even longer. I have more information written down for day 2 than day 1. I have nothing written down for day 3. I guess I was just glad to be going home and there wasn’t that much to day 3 anyway. If this one starts getting too long I will cut it off and just add the rest with day 3 in the next post, which I hope will be tomorrow. I’m feeling much better now from my cold. I do still have a little headache but I’m going to take a couple of aspirin right now before I begin the day 2 adventure. Hopefully by the time I finish day 2, the headache will be gone. I hate going in the other room to get the aspirin though because Lita is in there eating some stinky fish and I can smell today. I wish she would have eaten that yesterday or the day before when my nose was stopped up and couldn’t smell anything. Useless Knowledge: Chester Greenwood from the United States was 15 years old in 1873 when he invented earmuffs. 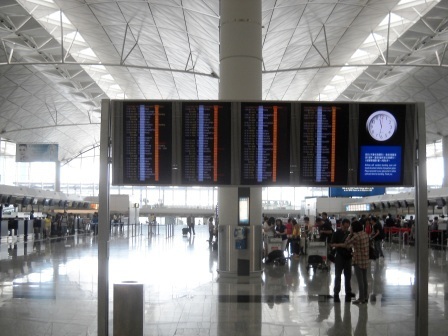 8 May – We arrived in Hong Kong at 0035, 20 minutes ahead of schedule. It must have been due to the high winds helping us along. Again I should mention that the seats we were assigned to were not the ones that I requested, exactly. We did get the seats we requested, but there was suppose to be only 2 seats in that row, there were 3 instead. This one actually turned out for the better, because no one sat in the additional seat and Lita could lie down. The fact remains though, the seats were not as advertised. We found immigration with little trouble and got the stamp that we came to get. I tried snapping my fingers to make us instantly appear back in the Philippines, but it didn’t work. I just wanted to get back now get the Balikbayan stamp in our passport and go home. Normally that would not be the case, but because of poor planning, having to pay full price for the airline tickets and thus having less money to use for vacation stuff, we were extremely limited on what we could do. I vow that that will not happen again though. I will schedule another trip to Hong Kong at some point soon and have a proper vacation there. Half of the flying is over now. We found a place to sit/lay down in aisle “D”. That is the aisle that Cebu Pacific will open up in later this morning. It’ s the beginning of the part of our little adventure that I was dreading the most. Lita had to sit down, I had to look around. I found Popeye’s with no problem. It was mixed in there with a couple of coffee service places. Not Starbucks, but the same type of service. I actually found the steak house first, it had great big letters that was hard to miss. 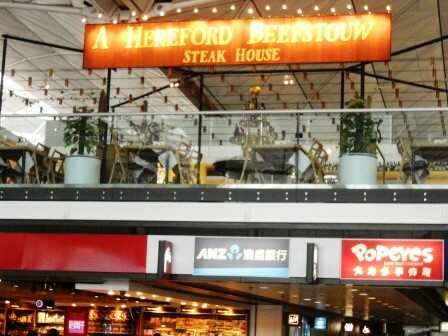 It is called The Hereford Beefstouw. We only had the $300HK, so I think Popeye’s would be the wisest choice for us. 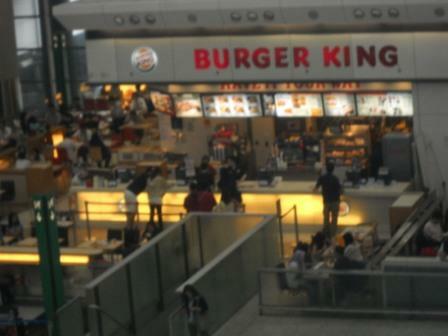 Of course there is a Burger King in this terminal somewhere, I just haven’t found it at this point yet. If you go up this escalator and turn left you will go to the Hereford Beefstouw. There are several other restaurants up there also, at least 6 others. There are several more upstairs a little further down also, including a Chinese restaurant (go figure). If you go back to look at the feature picture at the top, look at the letters above. Where the “E” is, turn left and this above picture of the escalators is what you will see. I saw a nice looking Japanese noodle place, but it was closed. I wish now it would have stayed closed, but I’ll get into that a little later. Around about 0630 we decided to get Lita some coffee and me something to eat. I didn’t tell Lita I was going to get something to eat at that time, but it turned out okay, because I got some Popeye’s chicken and it turned out that she misses it as much as I do. 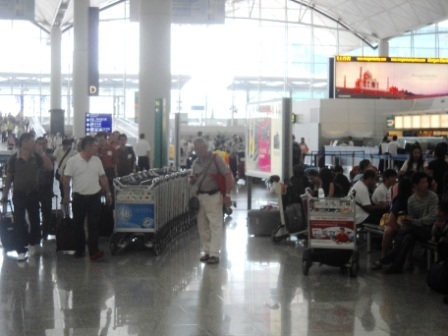 I already spotted where they will be opening the Cebu Pacific counters, so I can try to be first in line later. A couple of the coffee shops, “Cafe Ritasse” and “Toasty Toasty” opened at 0600 also, same as Popeye’s. Lita wanted to sit at the table that was the furthest from the counter for some reason. She sat, I went up to the counter to order. I checked out the 2 coffee places, but they always have these fancy names for their coffee. I just wanted to get a cup of “coffee”, you know just a regular cup of Joe. So Popeye’s was serving “coffee”, I wanted so Popeye’s chicken, so I got in their line. Okay if you have never been to Hong Kong, don’t let this next sentence give you a heart attack, okay? The price of 3 pieces of chicken (your choice), with fries, an upgraded to large drink and 1 coffee was $85. You okay? Now that is $85 Hong Kong, which in US dollars is about $11.33. Still high, but much better than $85, and about normal for an airport actually. Now did you notice that I said, “3 pieces of chicken (your choice)? No matter what 3 pieces of chicken you get, it costs the same price. That’s right, 3 breasts or 3 legs or 3 wings, or 3 thighs…all the same price. I thought that was strange. Now Lita loves the wings, but there was no way I was going to get a wing when I could get twice as much meat on a breast for the same price. Besides, the breast is my favorite part of the chicken. As the saying goes, “Give me 2 breasts and a roll and I’ll be one happy camper”. You can take that statement anyway you want. I’m going to be trying to save some of these Hong Kong dollars, at least 1 of each if I can. At this time I had only paper money in the denomination of 1, 5, 10, 20 and 100. I don’t know if they have a 50 or not. (Even now I don’t know because I never did see one). I doubt very seriously if any of the $100 bills will be left by the time we leave. I figure we have another 15 hours, so we should eat at least one more time today, maybe around 6:00pm. If we are not already in the restricted area, Lita wants to go back to Popeye’s when we eat later. I’m thinking that the Burger King is inside the restricted area, but I didn’t see it when I was upstairs by the restaurants. You can see down into the restricted area from there. As it turns out the Burger King is not even there. 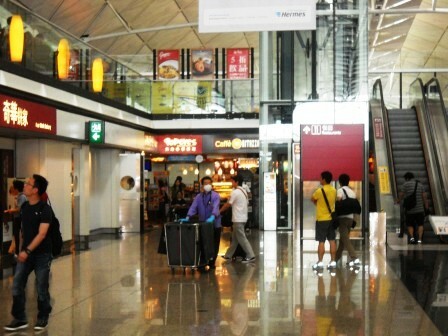 It is on the first floor in the Arrival area. 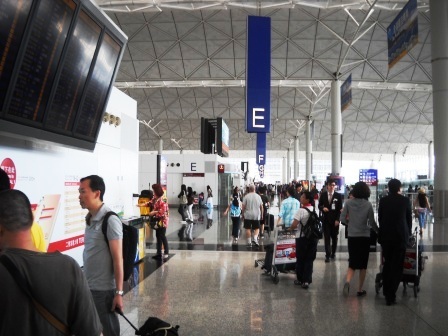 Here is a picture I took from the 2nd floor (Departure area). We decided to sit in Popeye’s for awhile. At least here I had something supporting my back. I figure that as long as it doesn’t get too crowded in here, no one will ask us to leave. The benches out in the aisles are not too bad, but there is no back support unless you lay down and even then it is kind of hard. Besides there are now too many people out there to be laying down and taking up all that space. Unless your Lita and you take up very little room anyway. She did end up doing just that later, laying down that is. I’m going to check to see just how early we can check into our flight and see if maybe we can get on an earlier flight instead of waiting until 2155 (9:55pm) tonight. The urinals in the restrooms here are American Standard. Useless Knowledge: A bowling pin needs to tilt only 7 1/2 degrees to fall. After we got back out to aisle D, there were quite a few people there. We lost our spot next to the sign, but there was still a pretty good spot further up. (See picture #2 above). I found out a couple of things about Cebu-Pacific to pass on to y’all. It may be standard for all airlines, but just in case. First thing, you have to wait until 3 hours before your flight to check in, unless you have done it online already. They have a special line for people that checked in online so you don’t have to go through the longer line. The second thing is that if you get the cheapo tickets (which we did), then you have to give at least 24 hour notice to change flights. So even though there were at least 3 other flights leaving before us, going to Manila, and even if they had a lot of empty seats, we could not get on the flight. Not even if we volunteered to pay the difference in the price (which I didn’t want to do anyway). I exchanged $3US that Lita found in her purse for $21.20HK. I had to exchange it at the Travelex North Gate because the Travelex at the South Gate didn’t want to take wrinkled, old money. I expected to get the same answer at the North Gate one, but the nice lady there didn’t have a problem what so ever. 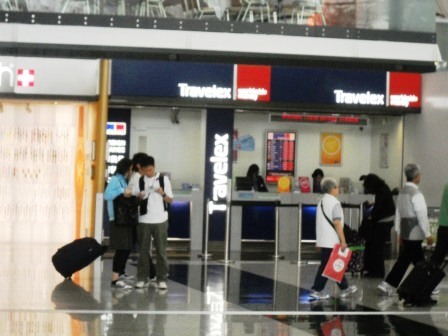 So if you are in Hong Kong in the departure area and need to exchange some not so new money, go to the North Gate Travelex at the front of the “G” aisle to exchange it. Lita got hungry again around 1:00pm so we went to the Japanese Noodle House. 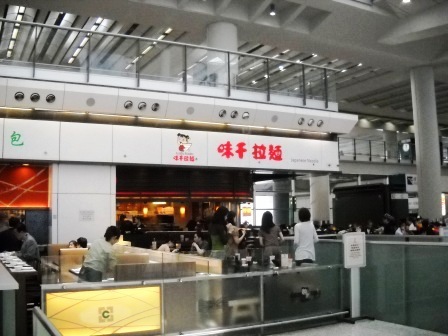 It is on the first floor to the right of Burger King, while facing Burger King. This is the time that I wish we never would have went there. They did not have yakisoba as I expected them to, but Lita did not want to get up and leave after we were already seated. She gets embarrassed. I wasn’t really hungry yet, but we still needed to get rid of of the rest of our HK$, except of course the ones that I was saving. This turned out not to be a problem, but I didn’t know it at the time. We had already bought the only souvenirs that we were going to buy. We got one coffee cup for Poppa ($55HK) and one shot glass for us ($35HK). Lita ended up ordering Fried Chicken curry with rice ($48HK) and I got Japanese Fried Rice ($50HK), plus a couple of “Red Pepsi’s”. I had an extra $140HK to spend and the bill came out to $144.10, so I had to dig into the money I was saving. I gave up my $5HK, but in return I did get .90HK worth of change that I didn’t have before. We ended up taking the food with us because Lita didn’t really like the curry that much and as I said, I wasn’t that hungry to start with, but the fried rice was very good. Eventually it got to the time we could check in for the flight. By then though there were a bunch of people there and they started getting in line way early, so I thought I missed out on my chance to be at the front of the line. I thought that…did you catch that part? Thanks to me talking to one of the very nice ladies at the Cebu Pacific counter earlier, I knew that there would be 3 counters open for tickets. There were only 2 lines forming because the third lady was not there yet. I went to the first counter, the line no one was in, and stood there waiting with Lita. Eventually someone showed up right before they started the processing. It turns out that the first line was to be for the Internet Check In. It has been at the right at the 3rd counter all day and now it moved. I thought I would have to get in the long line after all. I thought again. At the last minute the lady asked me if we I had any check in baggage. Of course we didn’t, thankfully. She went ahead and processed us. We were the 2nd ones out of there. Only thing is that it is so early, they do not have a departure gate yet. It’s cool, we’ll just wait in the better chairs in the restricted area. I’m going to stop now. I’m tired of typing. I’ll finish the rest of day 2 and add in day 3 hopefully tomorrow. I’ll put in a few more pictures and the history thing and call it a night. It’s 10:54pm now and my eyes lids are starting to get heavy already, and I keep yawning. Be sure to check out the end of our little, no so exciting adventure, tomorrow. Useless Knowledge: Debi Thomas was the first black athlete to win a medal at the Winter Olympics, and is the holder of 2 national championships and 1 world title in figure skating. She is now an aspiring orthopedic surgeon at Chicago’s Northwestern University Medical School. 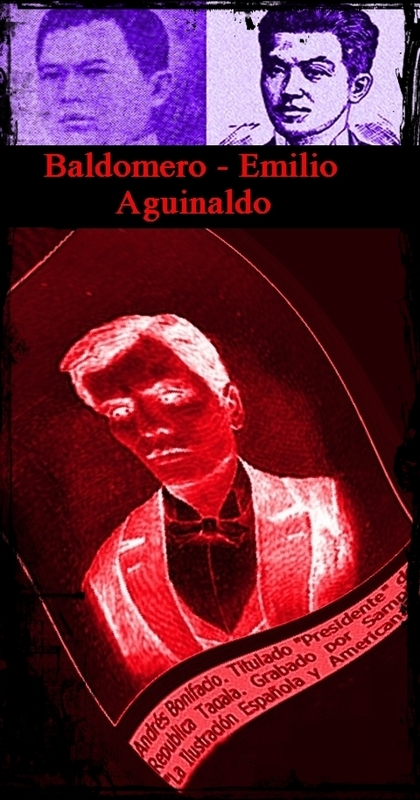 enlisted soldiers with guns and swords without proper authority from this government of the Tagalog provinces; that Andres Bonifacio, with his brothers, Procopio and Ciriaco, often held secret meetings with Diego Mojica, Silvestre Domingo, and Santos Nocom, and that it was their design to overthrow the government and kill the president. Apparently the internet and cell has been down because of problems with the fiber optics out at sea just off the calbayog coast. They have repaired the problem but are tweaking their services for better reception. Atleast this is what they say is happening. Glad to see you had a good trip John. Feeling better now? John, what did you think of the HK airport? I thought the HK airport was well portioned. It was so large, but it was easy to find your way around. All you had to do was go around a little bit and look. The Internet has been down all day, until about 10 minutes ago, and it’s too late to start the post for today because I wouldn’t finish it before it was time for me to go to bed. I will have to do it tomorrow. Sorry about that y’all. The cable has been on and off about 8 times today also.